Gong Ill reignited the desire for this spear-wielding, Mad Max-esque character to finally make her debut in the game. They put together a complete 3D model with textures that represent that few pieces of art that Blizzard has released of her. Like some of Gong Ill’s previous Overwatch-related works, the Junker Queen concept looks like it would fit into the game well. The art style is reminiscent of the exaggerated style that Blizzard uses in the game, and her silhouette is distinctly different than other heroes — a trait that is important in fast-paced multiplayer shooters. Gong Ill doesn’t offer any design ideas with their model but I think the game could use a character with an anti-crowd-control ability right now. Many heroes have the ability to stun or knock you back, so a hero with an answer to that could be interesting. Imagine if the Junker Queen slammed her spear into the ground to surround herself with a protective aura. Maybe her spear could also extend and pierce through grouped-up enemies. A lot of the current hero design seems to focus on high-damage output and ridding the game of Tank-heavy team compositions. The Junker Queen could be an answer to that in the form of a Damage hero with Tank-like abilities. We already have a Tank and Support hybrid with Brigitte, it wouldn’t be a shock to see a similar combination. 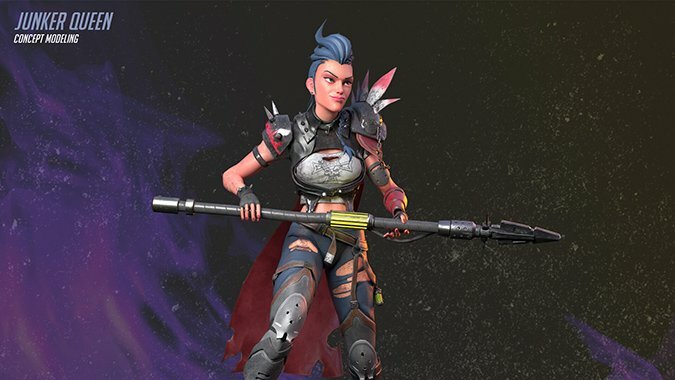 The Junker Queen has concept art and a voice actress already. She’s not that far off from being a hero, especially when you consider that Ashe was originally only supposed to be a character in McCree’s short. With some smart hero design, she could be a compelling character that fits perfectly into the game’s ever-growing roster of heroes.